index, inflation and other indicators as well. The Malaysian economy has been growing between the range of -6 to 10 % per year for the past 10 years. This can be indicated by the graph below. Keynesian policy on pump priming the economy. guru of Keynesian ideas said “lack of demand” is the fundamental problem of this crisis. those who got the Government contracts will spend more and hire more people at the same time. least one while a fiscal contraction according to the IMF the multiplier effect is (–1.5 times). corresponds to the monetary easing policy of the Government. See below. a RM1 in debt incurred into the economy will create a RM 1 rise in GDP. USD 296.4. in 2016 or 28.%. We proceed to look at the Malaysian Total External Debt. in December 2016. This is equivalent to an increase of 44.8 times. it in a graphical manner. The summary is as follows. we have build up more than RM 900 billion in external debts. Is it worth it? our debts not increasing it as in this case. spend most of their income on wages and business expansion. From wikipedia. https://en.wikipedia.org/wiki/Circular_flow_of_income. projects, pensions and cash handouts like our BR1M. what we called a budget deficit. This means our government is spending more than it receives. 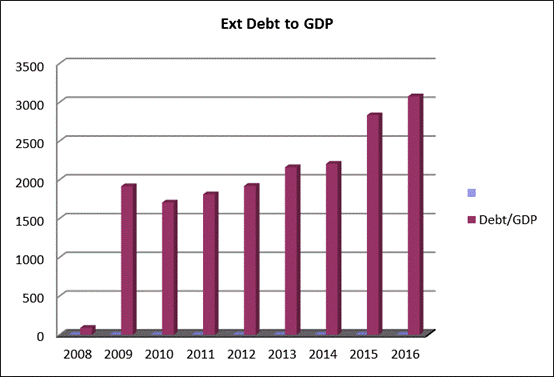 will need more external debts in order to maintain our economic growth. the table of our balance of payment from 2009 to 2012 in summary form. and transfers of residents in one country to residents of another. The Capital Account deals with the import and export of assets. It records the transactions related to international movement of financial assets. The Statistical Discrepancies or Error and Omissions deals with the problem of data accuracy and timing. there might be some problems with the data due to delay and timing. To force the current and capital account to balance, statistical discrepancies is brought into the equation. However if you look deeper into our Balance of Payment above, you may find some irregularities in their classifications. some of its debts. Malaysia obviously goes for the first option and that is to add to its reserves. the surplus? 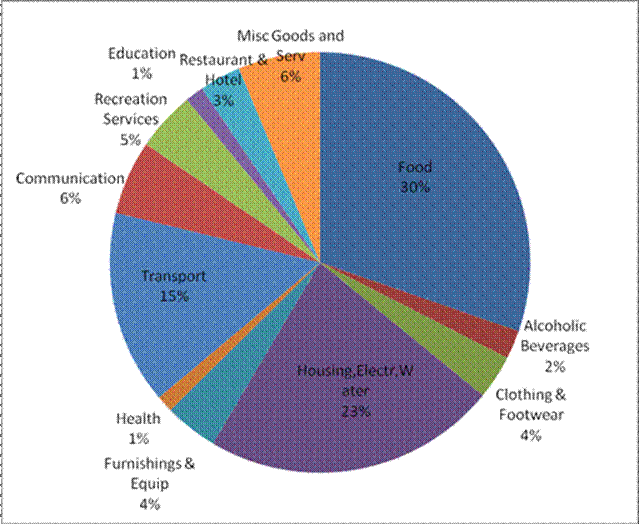 Why burden the people by reducing subsidies and increasing taxes (GST)? Secondly, why such a huge Statistical Discrepancies? As you notice the main objective of the Statistical Discrepancies is to force balance the account due to the delay or accuracy of the respective accounts. Normally these are only minor adjustments and don’t run into tens of billions. If that’s the case then there are some serious problems with our data accuracy and hence suspicion. This may be due to large hidden capital outflows from Malaysia to other countries. From 2009 till 2012 it totaled RM 168 billion. Whatever it is, I am certain that there isn't any Malaysian company that can afford to invest that much as Outward Foreign Direct Investment. Hence this explains why this item has a very large adjustment figure. To explain it differently, there are people secretly diverting funds out of our country. The following chart shows the illicit funds flowing out from Malaysia by Global Integrity. of the financial transaction flows between our residents and foreigners. infrastructure project. In the end the project might end up costing more than twice the original amount. A very common practice is by issuing variation orders. corruption ,collusion and dubious practices between the management and suppliers and contractors. we are ranked 62 out of the 175 most corrupted countries. See below. past 20 over years. What are the side effects of the above actions? the money supply will grow larger and in time there will be too much money chasing too few goods. as of March 2018. Is that right? See below. figures through the manipulation of statistics. of goods and services only went up by 2-3% per annum. So we know our government lied. article on how the Malaysian Government manipulates the CPI. It is a long article about 40 pages. Malaysia with the weights assigned to each of the 12 groups. The full report are from this link. The 12 groupings and their respective weightings are as follows. From the above we know the weightings assigned for the different groups. Listed below are the flaws in the calculation of the CPI. 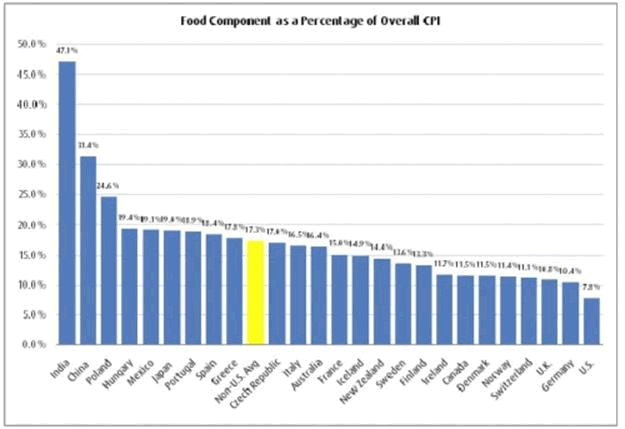 chart is the for the food component as a percentage of the CPI for 25 countries around the world. actually reflect the price rise in the CPI. much better than the rest of the world or the FAO’s figure is inaccurate? b) bias in Housing,Water,Electricity,Gas and other Fuels. ‘Rental for Housing’ which was allocated a lion share of 17.24% out of the 22.59% or 76%. Electricity, Gas and other Fuels only take up 3.34% while the Water Supply share is 1.34%. Heck, since when rental is more important than Electricity and Gas in our daily expenses? on the overall grouping and hence the calculation of the CPI figure. cost has been ever rising for the past years? represented as the cost of education had going up in double digits especially in the tertiary level. parents today? Thus any big increase in education fees are not accounted for in the CPI calculation. to reflect the changes in our lifestyles nowadays where people prefer to eat out than to cook at home. so as to report a much lower inflation rate. 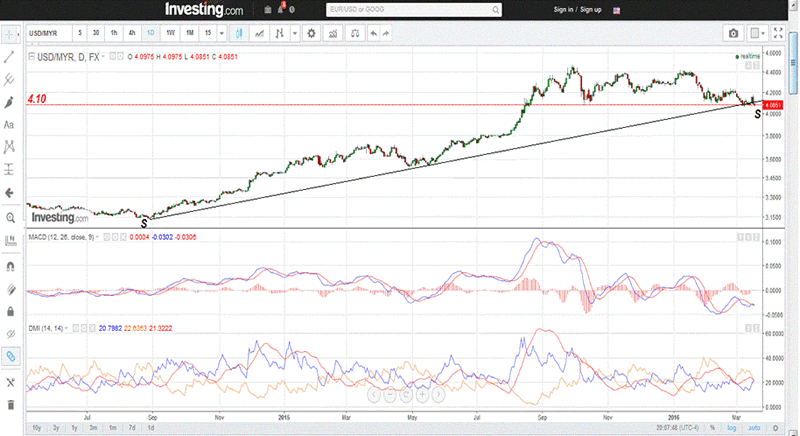 Ringgit and will put pressure on the Ringgit exchange rate. Similarly when there is a leakage in the economy there will be outflow of funds from our economy. Those funds are normally in USD and hence which means people are selling Ringgit to buy USD. This will again create another hugh supply of Ringgit. The following is the chart of our Ringgit against the USD. As can be seen from above the Ringgit depreciated from 3.10 in 2016 to a low of 4.5 in 2017.
reckon the Ringgit has been artificially propped up due to the following. buying Ringgit. This creates a sense of false demand for the Ringgit. See the chart below. b) Upward revision of our interest rates by 25 basis points. a positive as foreign investors will bring along USD which will then be converted to Ringgit.